A mass exodus amongst Chesterfield supporters and shouts for manager Dean Saunders to be sacked greeted the crushing 4-0 defeat by lowly Swindon Town at the Proact Stadium this afternoon. 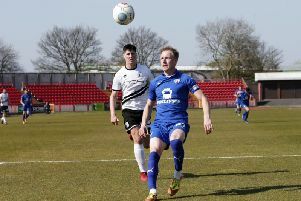 Swindon inflicted the fourth successive defeat on the Spireites on a disastrous afternoon for Chesterfield who were slow out of the blocks at the start of both halves. When they conceded the fourth on the 80th minute, a second goal for ex-Spireite Nicky Ajose, home fans streamed home amid shouts of ‘Saunders Out’ from the stands. Ajose turned in a cross from the impressive Ben Gladwin in the third minute and the deficit was doubled before the quarter hour mark when Louis Thompson put an angled shot beyond a culpable Tommy Lee. Dan Jones, who was later stretchered off, volleyed wide and Jay O’Shea hit the bar before, three minutes after the restart, Jon Obika took advantage of an Ian Evatt slip on rain soaked surface to left-foot home from 18 yards. Swindon, who sat back for most of the time after their second goal, saw keeper Lawrence Vigouroux make a stunning close range save to deny sub Mani Dieseruvwe and he also had to palm away a Rai Simons’ low shot. With time ticking by Fabien Robert burst into to box to set up Ajose for his second to make it the first 4-0 home defeat since Charlton won here in January 2012. It was almost five but Lee tipped a Gladwin rocket onto the post just before the 90 was up. 5,540 were there, but only 255 went home happy. Saunders had rung the changes in his line-up with five switches in personnel and he changed his formation in a bid to try and win at home for just the third time this season. In came Liam O’Neil, Charlie Raglan, Ollie Banks, Rai Simons & Gboly Ariyibi, the missing starters from Tuesday night’s 3-0 loss at Doncaster were Sam Hird, Richard Wood, Chris Herd, Dan Gardner and leading scorer Sylvan Ebanks-Blake, all five were on the bench. Chesterfield: Lee, O’Neil, Evatt, Raglan, Jones (Herd 57); Banks, Morsy; Simons, O’Shea, Ariyibi; Novak (Dieseruvwe 51). Subs (not used): Chapman, Hird, Ebanks-Blake, Gardner, Wood. Swindon: Vigouroux, Barry, El-Abd, Turnbull, Ormonde-Ottewill (Brophy 82), Rodgers, Thompson (Iandolo 78), Robert (Balmy 86), Gladwin, Obika, Ajose. Subs (not used): Belford, Ojamaa, Stewart, Hylton. Attendance: 5,540 (255 from Swindon).